Conveniently located inside very close to the bus and train station, Hotel Goartin is a comfortable budget hotel in Malaga. The city center and several shopping areas are also situated nearby. Our room and its facilities were clean and comfortable. The employees was warm and warm and friendly and extremely willing to give us (non-Spanish first-time visitors to Malaga) as much help as possible. Our room and its facilities were clean and comfortable. The employees was warm and friendly and very willing to give us (non-Spanish first-time visitors to Malaga) as much help as possible. 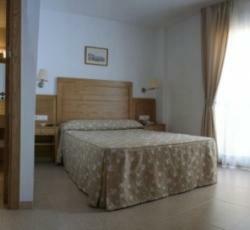 The room was very clean and the location was brilliant for the bus station. People from the reception are really helpful. We forgot clothes at the closet and they send to us in Madrid. They are really helpful and friendly. They have a garage (9euros per night) and the room is really clean. The only downside is that the hotel is not so properly located. But it is 10 minutes by bus from the primary attractions. People from the reception are really helpful. We forgot clothes at the closet and they send to us in Madrid. They are very helpful and friendly. They have a garage (9euros per night) along with the room is very clean. The only downside is that the hotel is not so well located. But it is 10 minutes by bus from the major attractions. Its very clean, very new, it looks just recently build, or restored, modern, everything clean, spotless, even bit &"sterile&". location is just outside bario of malaga, near to train-bus stat, but bit shabby. balcony surronded by high walls, feels safe, but no wiew, anyway, wiew on high blocks of buildings, or street, but if u close window, very quiet. the bed is bit small for 2 people. bathroom perfect. warm and friendly staff. i woud recomend it to travelers who just came to malaga by bus or train, and dont want to take taxi cab to the center. 55E for such modern and clean room /2pers. its ok.
Its really clean, really new, it looks just recently build, or restored, modern, everything clean, spotless, even bit "sterile". location is just outside bario of malaga, near to train-bus stat, but bit shabby. balcony surronded by high walls, feels safe, but no wiew, anyway, wiew on high blocks of buildings, or street, but if u close window, really quiet. the bed is bit small for 2 people. bathroom perfect. warm and friendly staff. i woud recomend it to travellers who just came to malaga by bus or train, and dont wish to take taxi cab to the center. 55E for such modern day and clean room /2pers. its ok.
* Hotel Goartin rated 4.33 out of 5 based on 9 customer reviews. Hostel reviews with a star rating are sourced from HostelBookers. If you find Hotel Goartin with the same booking conditions at a lower rate somewhere else on the internet after you have booked, we will refund you the total difference.